Zyrtec, or cetirizine, is an antihistamine drug used for the treatment of seasonal allergies and its symptoms, such as rhinitis (runny or stuffy nose), cough and allergic skin manifestations like atopic dermatitis or urticaria. 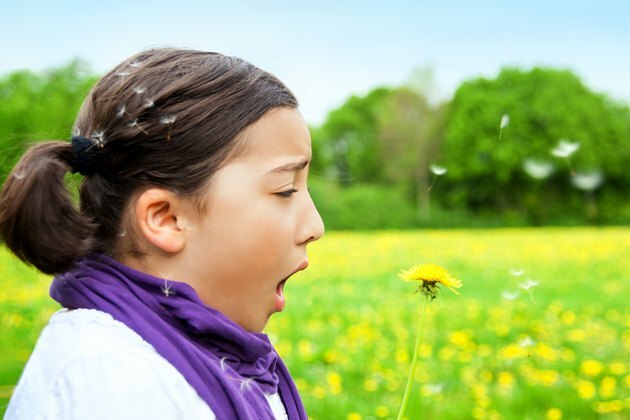 Zyrtec works by competing with histamine, the primary substance involved in allergic reactions, for receptor sites in different molecules, therefore blocking the allergy-triggering effect of histamine. Children can take Zyrtec in liquid or chewable tablet form. The most common side effect in children taking Zyrtec is drowsiness or sleepiness. One of the reasons it does this is because histamine is a neurotransmitter, an important protein that helps in the transmission of signals between neurons in the brain. By blocking the action of histamine, medicines like Zyrtec decrease the activity of histamine in the brain, resulting in drowsiness. Even though Zyrtec is considered a non-sedating antihistamine, children can still feel drowsy when taking it, so physicians usually recommend giving it at night, before sleep. Paradoxically, some children exhibit hyper-alertness, excitability and hyperactivity when taking some antihistamines. Other common side effects include headache, dry mouth and nausea. Children taking Zyrtec can exhibit cardiac abnormalities, like palpitations or tachycardia (rapid heart rate). They can have either high or low blood pressure, although sometimes these changes in blood pressure will go unnoticed. Some children will have gastrointestinal side effects, like abdominal pain, diarrhea, loss of taste and decreased appetite. Patients may develop a rash that can mimic an allergic reaction. Occasionally, children can develop coughs, nose bleeds and increased urination. The reported rare side effects of Zyrtec administration can be the most serious. Children can have convulsions or seizures. They can develop aggressiveness, violent behavior, suicidal ideation and other serious behavioral changes. They can exhibit hallucinations, confusion, depression and syncope (passing out). Rarely, children taking Zyrtec can develop hemolytic anemia, in which the body starts destroying its own red blood cells; or thrombocytopenia, in which the platelets (the blood cells involved in clotting) can be dangerously low, leading to spontaneous bleeding. The worse side effects occur in accidental or intentional overdoses of Zyrtec or in patients with liver problems, as Zyrtec is metabolized by the liver, and children with failing livers can inadvertently build up higher doses of the drug in their bloodstreams.